Writing is important. We all know that content is one of the most important aspects of a business and without writing, you can’t produce content. Needless to say, it’s pretty critical that you have a good handle on writing, or a good editor, before you disseminate valuable content to your customers. Wait–don’t leave yet. If you’re the guy or gal that thinks writing isn’t your strongest quality, you’re not alone. You don’t need to be good at writing to succeed; you only need to know the critical elements that create writing success. There is no better role model or influence to turn to than Seth Godin. Seth Godin is a business/media strategist who takes pride in helping people. However, his books don’t always top the charts and his blog is rather short and simple. He understands the important aspects of writing and he goes from there. You can do that, too. One of your foremost goals when writing should be to connect to your audience. Frankly, without a connection, you have no audience. Who wants to read something that isn’t appealing or interesting? I know that I don’t. Creating a connection with your audience will get you far in your career as a writer. 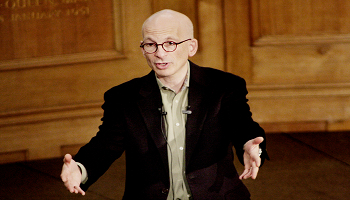 Seth Godin creates connections using stories, one-liners, and memorable but short quotes to get you thinking. It’s like he is right next to you holding a conversation. Also, connections enable readers to keep coming back to your content. If they can relate to you one time, they will long for that connection the next time. Our memories map out our lives. Memories of happiness will encourage us to continue on a certain course and painful memories will guard our hearts forever. When writing, make sure that you create good memories for your audience. You don’t need to be a super sophisticated writer to create memories. You don’t need to pen brilliant words. In fact, all you need to do is be authentic and down to earth. When you’re authentic with your audience, they trust you and they begin to open up to your words. Make sure that you captivate them with your realness and use that to create positive memories for your readers. Remember, positive memories come in handy when you release new content because those people you’ve touched will recall their experience with you and will return the favor time and time again. You’ve heard us talk about it before and this isn’t the last time we’ll touch on it: creating value for your customers is much better than anything else. If your customers know they are getting a product with a high value, they a more willing to be repeat customers and spread the word. Value does not mean a low priced product. Sure, lower prices might be more appealing at first but if you can provide free content that has a large value, you’ll immediately attract potential customers and win market share. We all want to be valued. When you’re writing, make sure that you give away as much information as possible. Don’t hold all of the cards because the more hidden you are, the less people will trust you. Creating connections, memories, and value will help your writing stick.